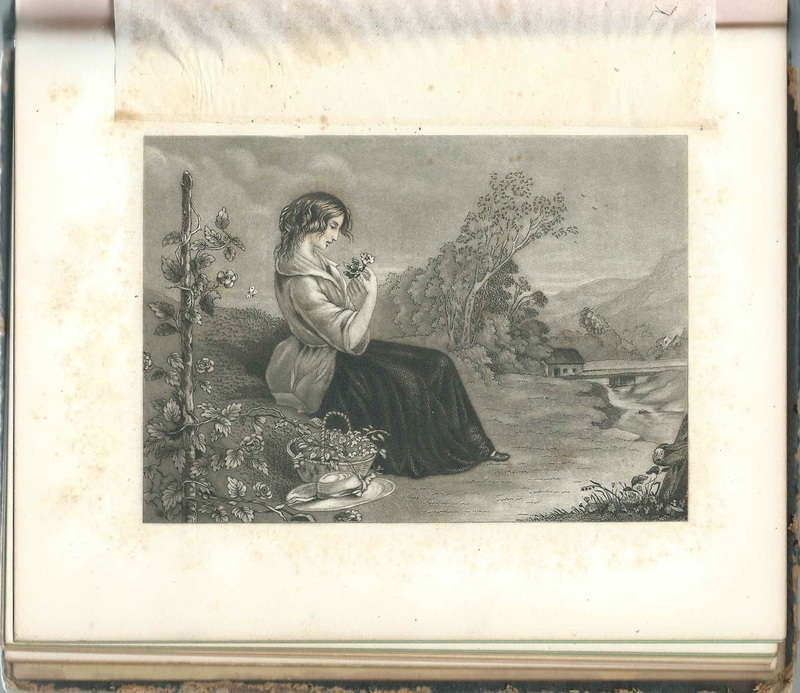 1840s autograph album and journal of Jane C. McDonald of the Joliet, Illinois, area. Jane would marry Charles H. Weeks, who became an Ilinois judge. 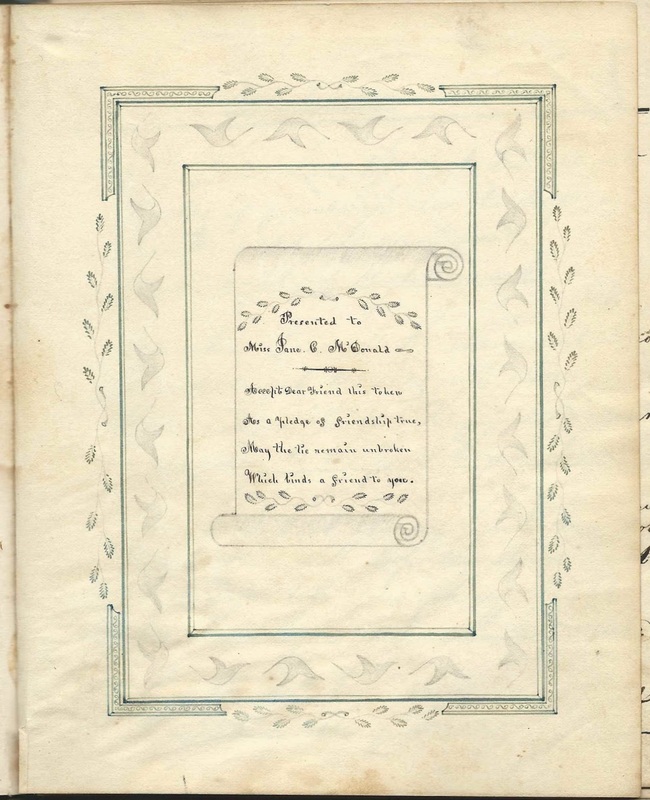 The album has a few items tucked inside, including letters, one of which was written by Charles H. Weeks, and a wedding memento that I believe was addressed to Jane's brother Jonathan Stickney McDonald. 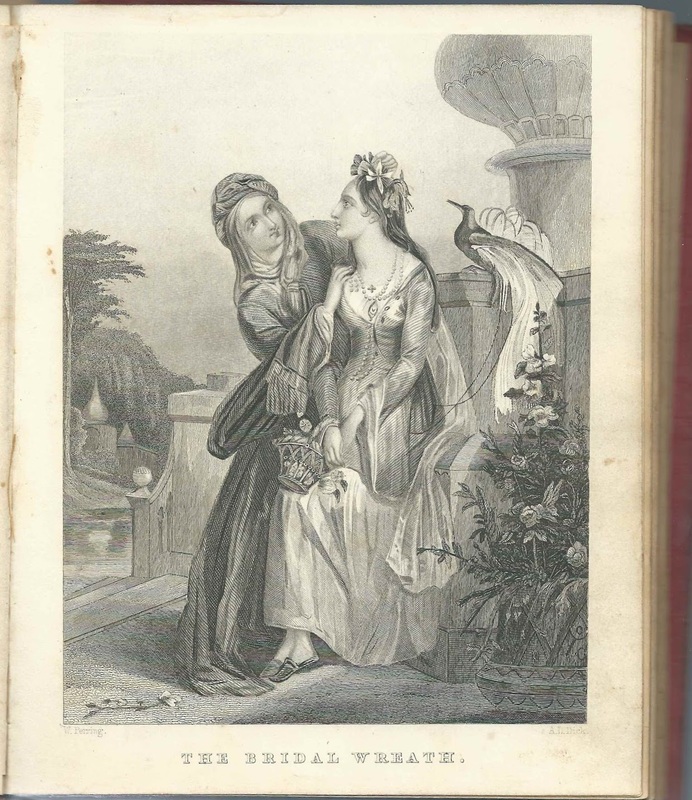 The album measures approximately 7-3/4" x 6" and contains only a few sentiments, most of which lack the inscriber's full name. Tucked inside the album are three letters, a paper scrap and a tiny envelope with two cards inside, one bearing the maiden name of the bride and one bearing the married name of the new couple. An alphabetical list of people whose names occur in the album itself or on one of the items tucked inside appears at the end of this post. 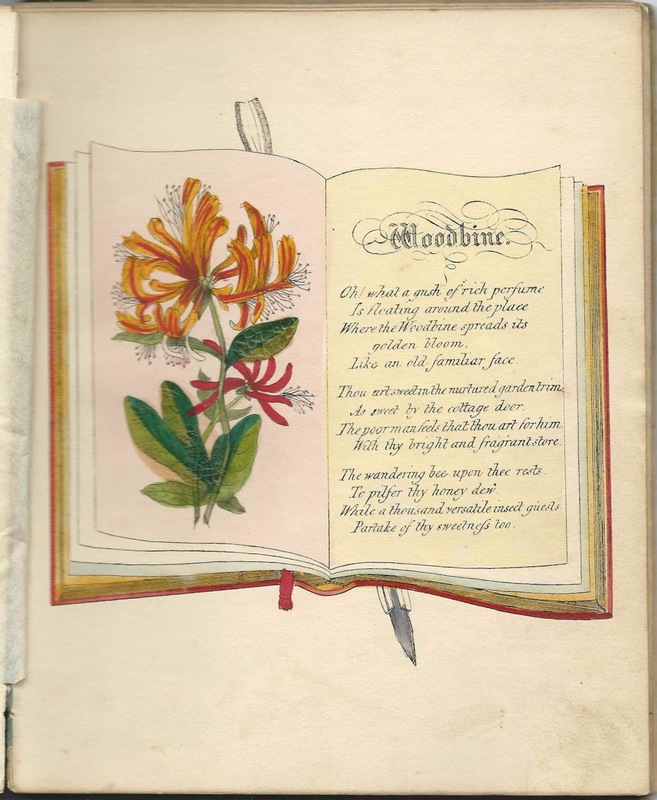 The album was published by J. C. Riker of New York and contains four handcolored engravings of flowers scattered throughout. 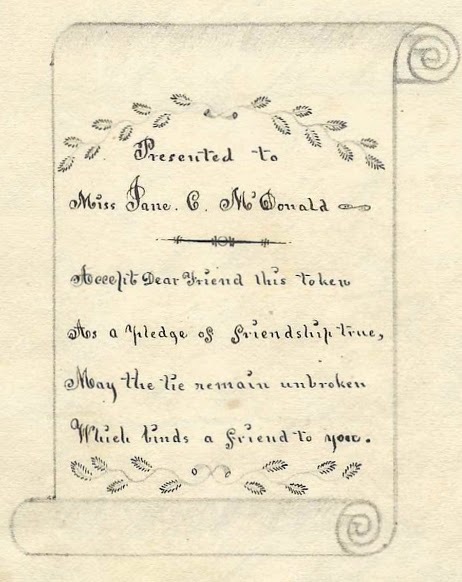 Jane C. McDonald was born at Syracuse, New York, on April 2, 1827, the daughter of Asa and Olive (Rudd) McDonald. She married Charles H. Weeks, a New Hampshire native, on May 6, 1846 at New Lenox, Illinois. He was born June 7, 1821, the son of Nathaniel and Abiah (Haseltine) Weeks. Read more about Jane and Charles and their families here. Jane and Charles, who became a judge, made their home at Joliet, Illinois, and had three children, two of whom died young. Daughter Eva Weeks would marry George H. Munroe. 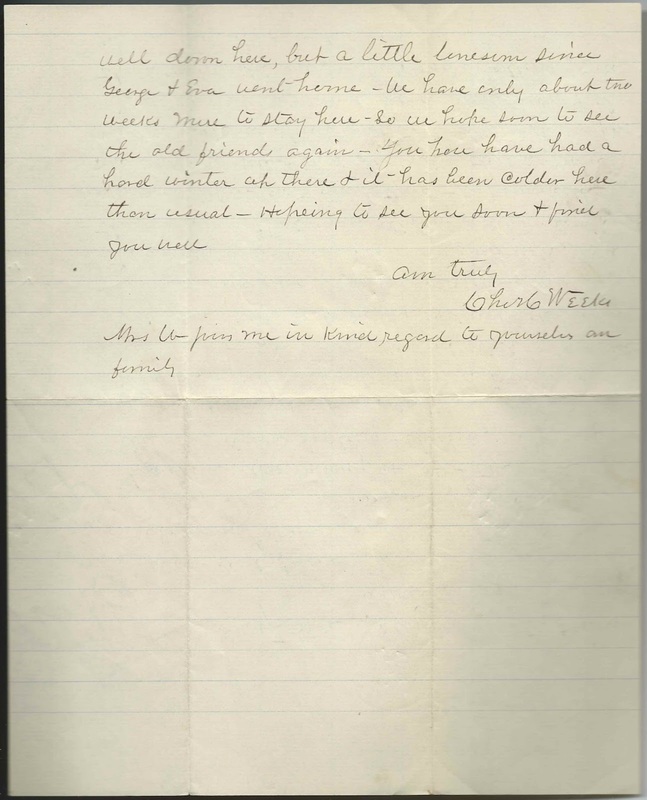 One of the items tucked in the album is a letter that Charles H. Weeks wrote to his friends, the Frasiers, while he and Jane were enjoying a vacation in Florida in April 1899. Sadly, he would die less than two months later. Jane died in 1817. 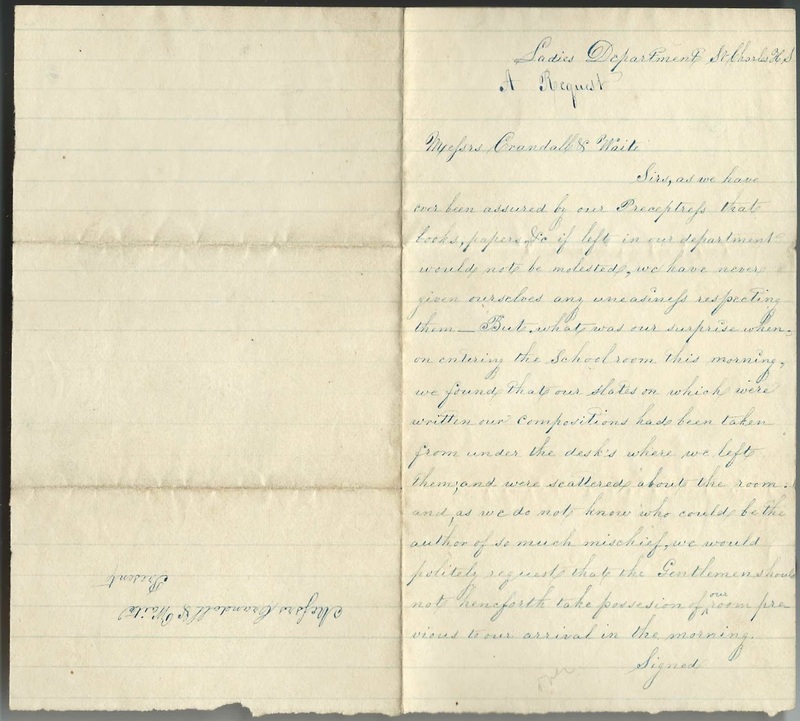 Another interesting item tucked in the album was a letter signed by eleven outraged young women and directed to Messrs. Crandall and Waite of the Ladies Department of St. Charles High School at St. Charles, Illinois. Apparently a male student or more had had the run of the schoolroom before the young ladies arrived in the morning and made quite a mess of their slates. Ladies Department, St. Charles H.S. Sirs, as we have ever been assured by our Preceptress that books, papers, etc. if left in our department would not be molested, we have never given ourselves any uneasiness respecting them. But what was our surprise when, on entering the School room this morning, we found that our slates on which were written our compositions had been been taken from under the desks where we left them, and were scattered about the room, and, as we do not know who could be the author o so much mischief, we would politely request that the Gentlemen should not henceforth take possession of our room previous to our arrival in the morning. Another interesting item tucked inside is a small envelope addressed to J. S. McDonald and containing two cards, one bearing the name Margaret W. Broadie and the other the names of Mr. and Mrs. R. Kercheval. 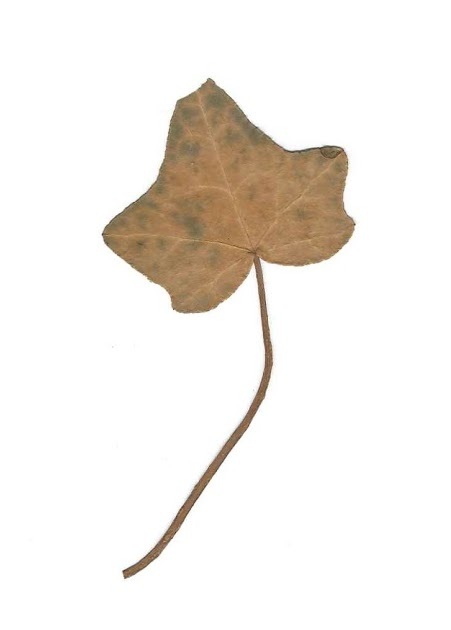 This item relates to the June 1857 wedding of Margaret W. Broadie [often seen online as Brodie] and Reuben Kercheval. It's likely that J. S. McDonald was Jane's brother Jonathan Stickney McDonald. 2 pages inscribed by ? - initials hard to read, but surname initial is S. Possibly A. G. S., who also signed the next page. Hellen M. Dole; co-signer of a letter tucked inside the album; addressed to Messrs, Crandall & White in the Ladies Dept at St. Charles H.S. 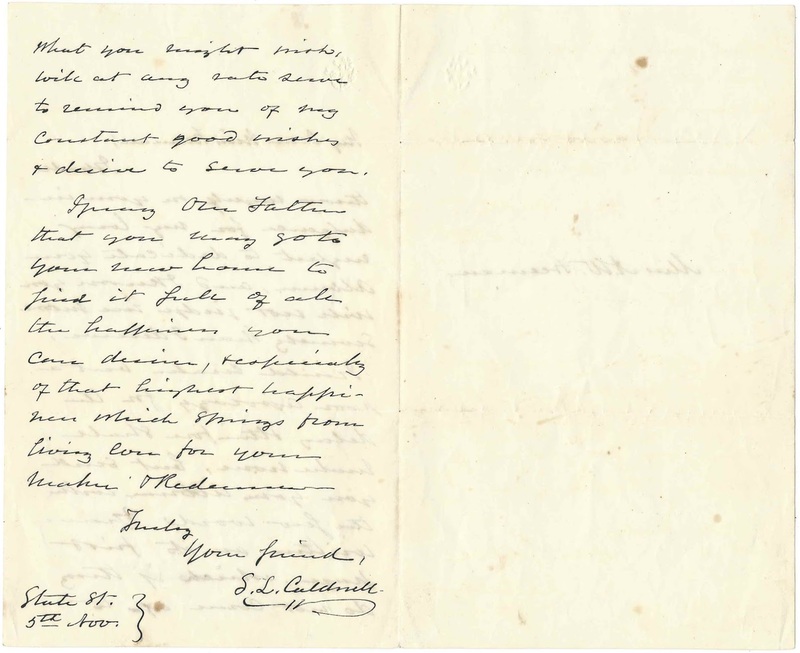 L. D. Doolittle, signed on June 8, 1845. Presumably Lyman D. Doolittle, son of Elijah and Arathusa (Cole) Doolittle. 2 pages inscribed by Mrs. L. D. Doolittle at Joliet, Illinois, on November 23 [no year written]. Wife of Lyman D. Doolittle. Lucy W. Fay; co-signer of a letter tucked inside the album; addressed to Messrs, Crandall & White in the Ladies Dept at St. Charles H.S. Tave Fay [? ]; co-signer of a letter tucked inside the album; addressed to Messrs, Crandall & White in the Ladies Dept at St. Charles H.S. Mary S. Fay; co-signer of a letter tucked inside the album; addressed to Messrs, Crandall & White in the Ladies Dept at St. Charles H.S. Eliza A. Jackman; co-signer of a letter tucked inside the album; addressed to Messrs, Crandall & White in the Ladies Dept at St. Charles H.S. 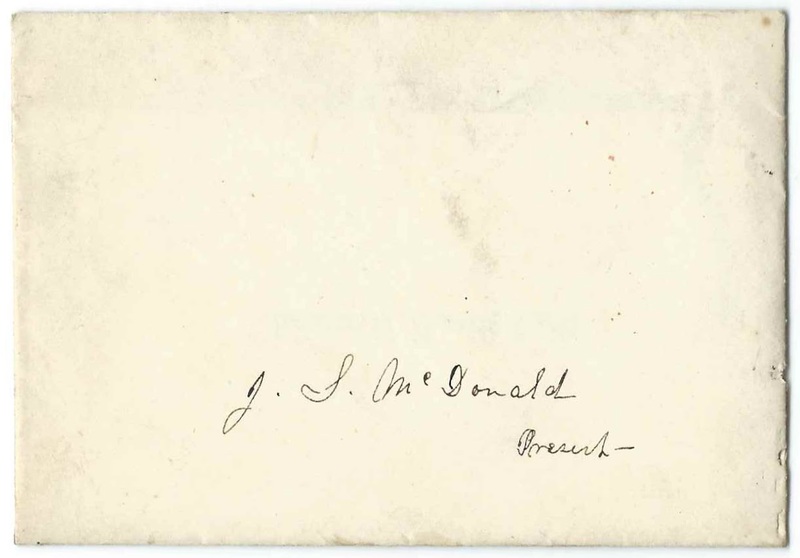 J. S. McDonald; presumably Jane's brother Jonthan Stickney McDonald; envelope tucked in the album; contains two cards, one of Margaret W. Broadie and the other of Mr. & Mrs. R. Kercheval. They were married in June 1857. Mary Person; co-signer of a letter tucked inside the album; addressed to Messrs, Crandall & White in the Ladies Dept at St. Charles H.S. Jane Sanford; co-signer of a letter tucked inside the album; addressed to Messrs, Crandall & White in the Ladies Dept at St. Charles H.S. Julia A. Simmons; co-signer of a letter tucked inside the album; addressed to Messrs, Crandall & White in the Ladies Dept at St. Charles H.S. Mary A. Walker; co-signer of a letter tucked inside the album; addressed to Messrs, Crandall & White in the Ladies Dept at St. Charles H.S. Catharine Walker; co-signer of a letter tucked inside the album; addressed to Messrs, Crandall & White in the Ladies Dept at St. Charles H.S. 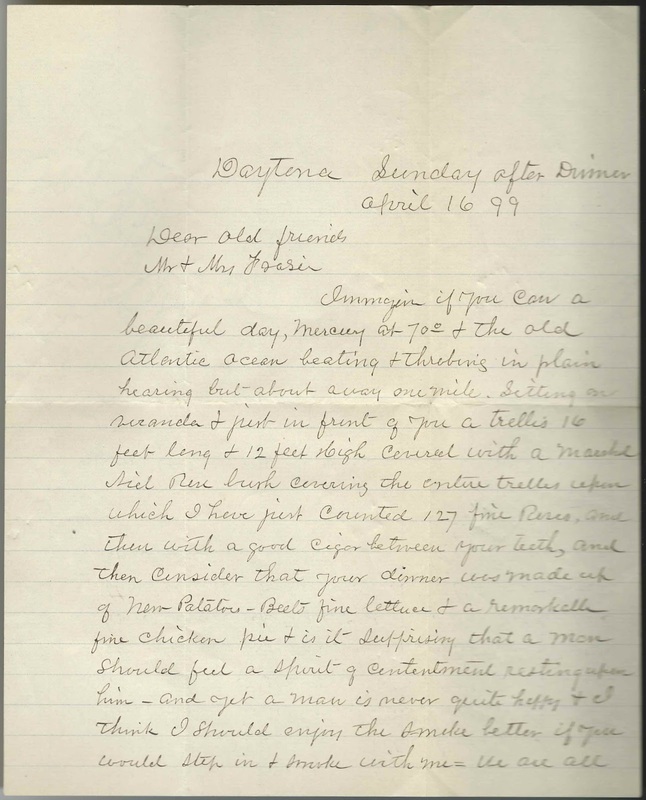 Charles H. Weeks, future husband of Jane C. McDonald; letter, tucked inside the album, that he wrote to Mr. and Mrs. Frasier on April 16, 1899 less than two months before his death. Susan Wood; co-signer of a letter tucked inside the album; addressed to Messrs, Crandall & White in the Ladies Dept at St. Charles H.S. 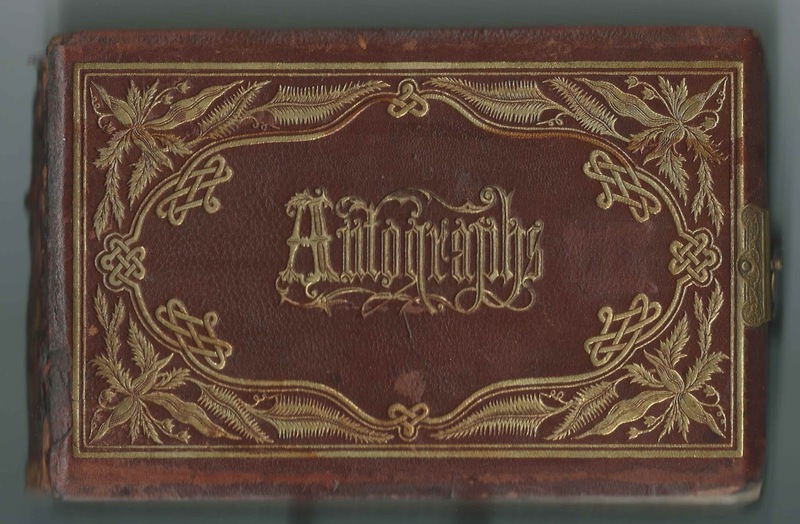 1846-1850 autograph album that belonged to Adalaide W. Freeman of Bangor, Maine. 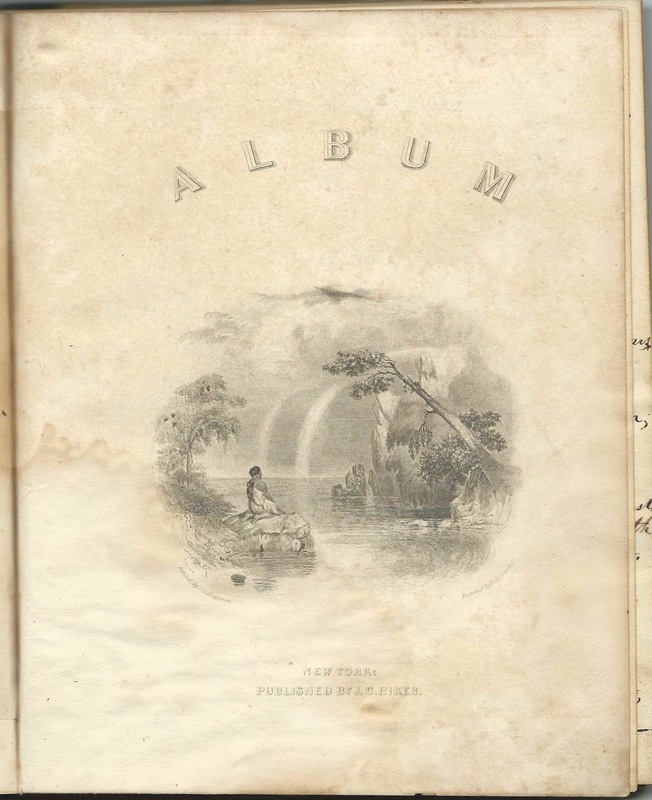 The album was given to her at Christmas in 1846 by A. M. C.
A. M. C. may have been the A. M. Chandler who signed the first page after the title page. I had to rule out Adeline Matilda (Price) Chandler, wife of James Nelson Chandler of Bangor, Maine, as they didn't marry until 1854. 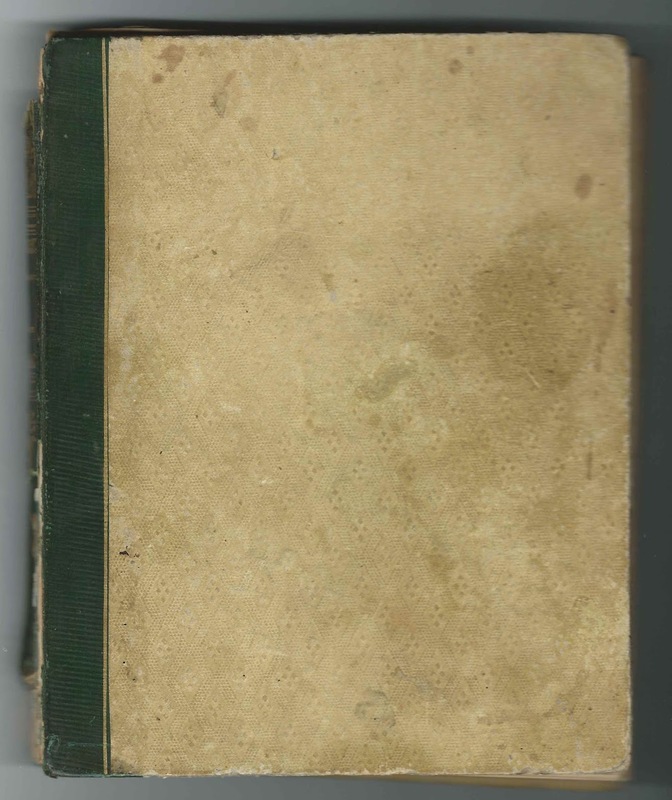 The album measures approximately 7-1/2" x 6" and contains the sentiments of over thirty people, most of whom, frustratingly, didn't give their full names. An alphabetical surname list and an alphabetical list of the signers, together with any personal information they forwarded, appear at the end of this post. 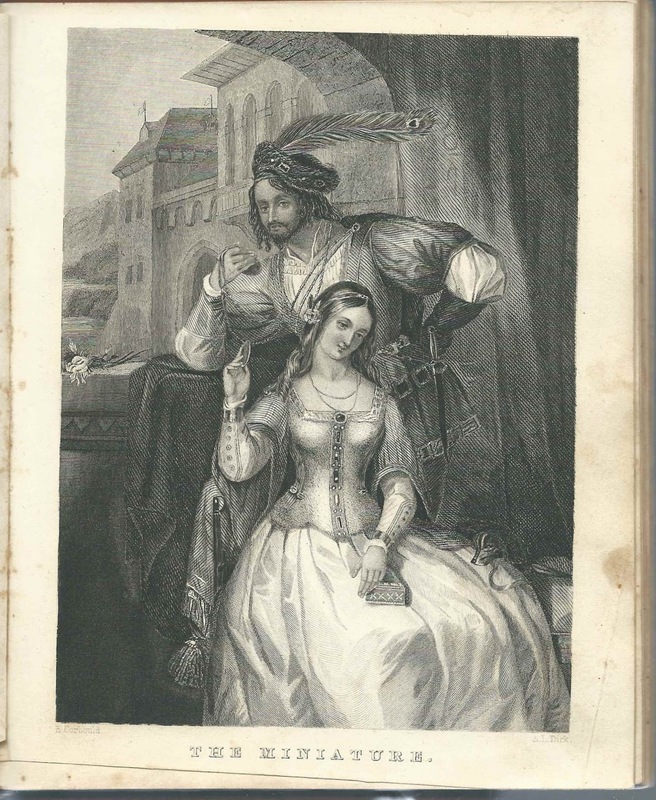 The album was published by J. C. Riker of New York and has several engravings interspersed throughout. The album has a letter tucked inside. 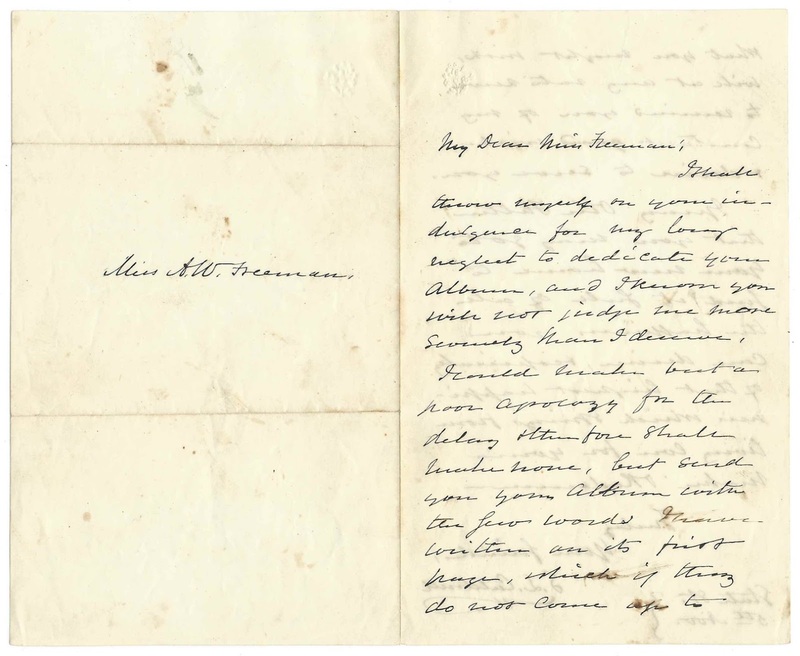 It was addressed to Miss A. W. Freeman and written by Rev. Samuel Lunt Caldwell, then of Bangor, Maine, and, later, president of Vassar College, who was belatedly responding to Adalaide's request that he dedicate her album. In the 1850 Census of Bangor, Maine, an Adalaide W. Freeman was living in the household of William Henry Vinton, his wife Sarah Ward (Goodhue) Vinton and their children, one of whom would grow up to be the noted artist Frederic Porter Vinton. Adalaide was given a birth date and place as about 1831 in Maine. Another woman in the household was a Jane Porter, born about 1815 in New Hampshire. Interestingly, I believe it was this Adalaide W. Freeman who married James C. Porter on November 12, 1850 at Bangor, Maine. James was born in New Hampshire, perhaps at Bath, about 1821. Was he related to Jane Porter? Is there a connection to Frederick Porter Vinton's middle name? 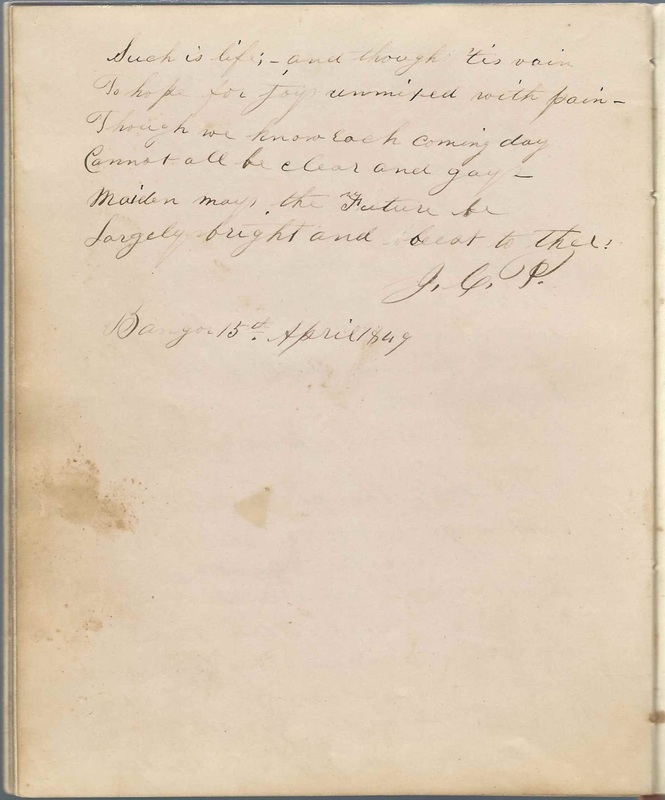 The album contains a page signed by a J. C. P. and a J. P. It stands to reason that James C. Porter was in Bangor, Maine during the time the album's sentiments were being acquired. Below, the two page sentiment that J. C. P. inscribed at Bangor, Maine, on April 15, 1849. 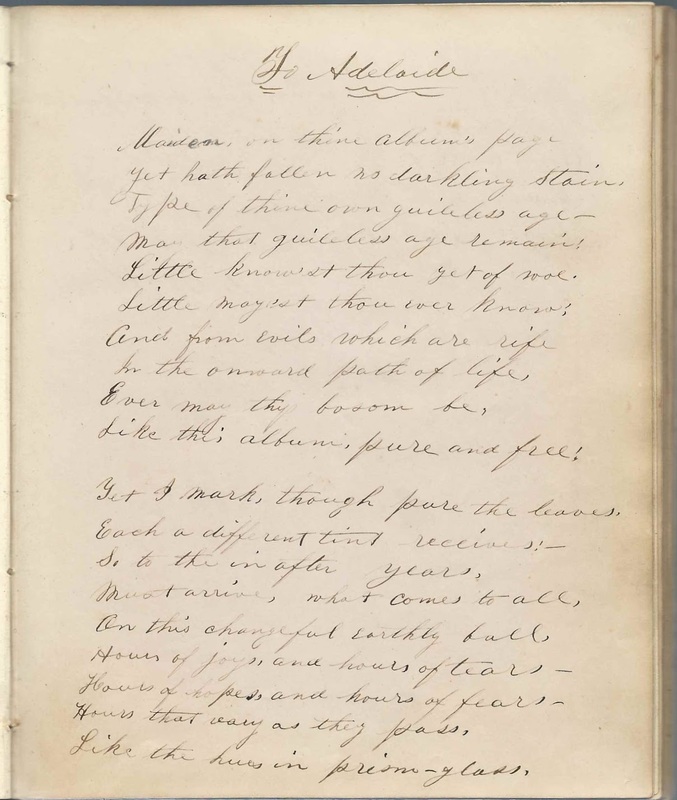 Note that J. C. P. inscribed the page to "Adelaide", though signers called her Adalaide, and her nickname may have been Ada. James and Adalaide would have a named Ada. By 1860, Adalaide, James, two children, and a Jane B. Porter who may have been James' mother or other relative, were living at Bath, New Hampshire, where James was working as a tanner. James was presumably the James C. Porter of Bath, New Hampshire, who appears in a Civil War Draft Registration Record for the New Hampshire counties of Cheshire, Sullivan, Grafton and Coos. Whether he served or not, I don't know. By 1880, the family, by now with three children, was farming at Stowe, Vermont. An 1895 Minnesota Census found James C. Porter, "Adelade" F. Porter and daughter Margaret living at Minneapolis. With them, or near them, were Luther C. Porter, age 71, born in Vermont; his wife Martha W. [Webster] Porter, age 71, born in Maine; and Gertrude Porter, age 20, born in Illinois. Luther Clark Porter, born February 18, 1824, son of Aaron and Rebecca (Blanchard) Porter, had first married Genevieve Alexander, on September 11, 1856. Interestingly, Luther's paternal grandmother's maiden name was Chandler; the Chandler name appears in the autograph album, coincidence or no. Luther and Genevieve had a daughter May Genevieve Porter, born May 1, 1858 at Danville, Vermont. Genevieve (Alexander) Porter died February 18, 1860. On August 18, 1868, Luther C. Porter married Martha Webster, daughter of Deacon Eliphalet Webster of Portland, Maine. By 1870 and through 1880 at least, Luther C. Porter had become a flour manufacturer and landowner at Neenah, Wisconsin. Gertrude Porter would have been born when Martha was about 50, which isn't impossible. But it's also possible that Gertrude was adopted or even that she was actually the granddaughter of Luther and first wife, Genevieve (Alexander) Porter. On the 1880 Census of Neenah, Wisconsin, Gertrude is listed as the daughter of Luther and Martha Porter. Interestingly, there was another daughter in the household, 20 year old May Porter, presumably May Genevieve Porter. Is it possible that Gertrude was May's daughter? May Genevieve Porter married Charles H. Wilson on July 25, 1885. Perhaps James C. Porter and Luther C. Porter were cousins? Another Porter living at Bangor was Rev. Charles Greenleaf Porter, son of Capt. Greenleaf and Elizabeth (Barrett) Porter. Rev. Porter's wife, Deborah H. (Cushing) Porter was memorialized by Anne T. Drinkwater in 1848. Was Rev. Porter another of James' relatives? 1) Ada I. Porter, born about July 1853; married Howard Thomas on March 17, 1881 in Vermont; later lived in Wisconsin. Her widowed father lived with her in his later years. By the time of the 1900 Census of Superior, Wisconsin, James was living with his daughter Ada and her husband Howard Thomas and family; he called himself a widower. I haven't yet determined where Adalaide is buried or the year of her death, though it must have occurred between 1895 and 1900. Sarah; surname initial might be F or T.
2 page sentiment by J. C. P., signed at Bangor, Maine on April 15, 1849. 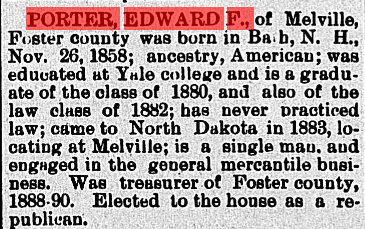 Presumably Adalaide's future husband, James C. Porter, whom she married on November 12, 1850 at Bangor, Maine. 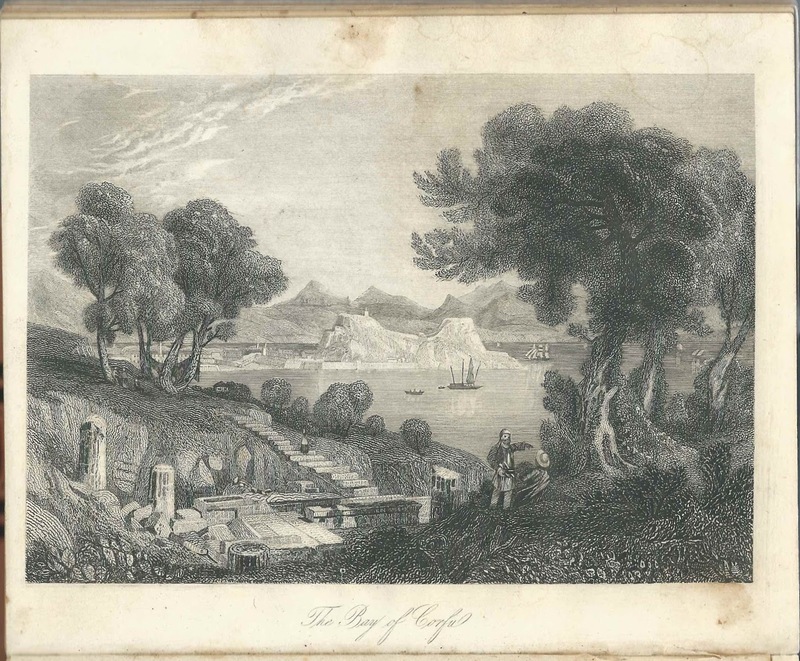 2 pages inscribed by J. P.
E. G. or E. T. or ? 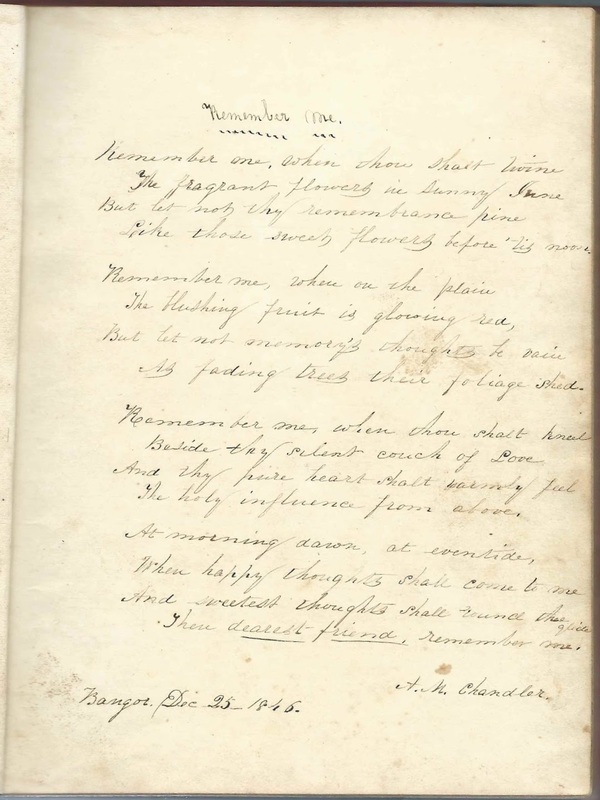 A. M. Chandler, signed at Bangor, Maine, on December 25, 1846. Presented the album to Adalaide. A. M. C. was presumably the A. M. Chandler who signed an individual page. Bernice Dickey, signed at Bangor, Maine in 1849. Presumably Bernice Perry (Smith) Dickey, wife of Bangor hotel owner John Calvin Dickey. E. S. French, signed at Bangor, Maine, on June 21, 1847; middle initial could be L. Perhaps Ellen Sophia French, daughter of Ebenezer and Sophia Carr (Barker) French. F. B. French. Perhaps Frances B. French, born June 8, 1830 at Bangor, Maine, daughter of Ebenezer and Sophia Carr (Barker) French. Frances would marry Charles W. Adams at Bangor, Maine, on December 16, 1852, and would die at Galveston, Texas in October 1853. Caro Liscomb, signed at Bangor, Maine, on September 30, 1850. Presumably Caroline Liscomb, born about the same year as Adalaide, on September 20, 1831, daughter of Thomas and Deborah Allen (Lowdon) Liscomb. 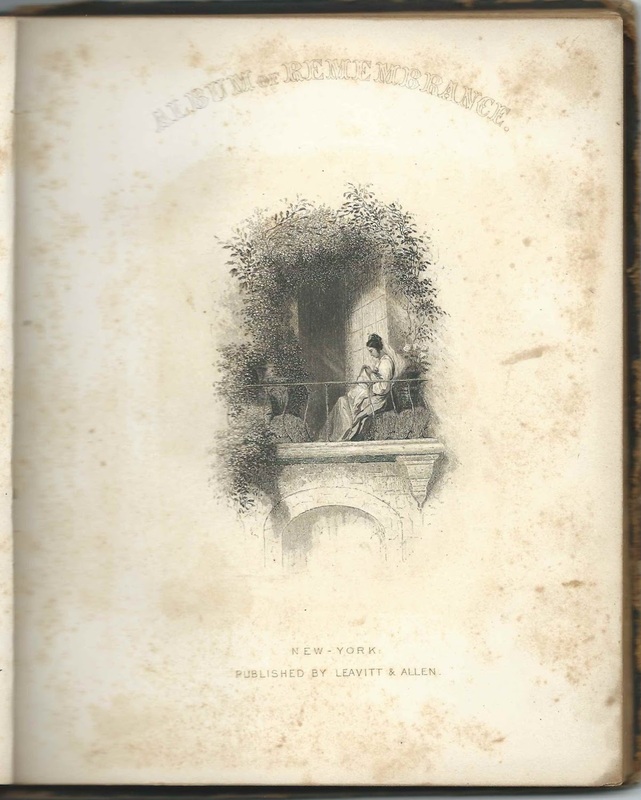 2 pages inscribed by E. J. Maltby or E. G. Maltby or ? Susan Parsons, signed on March 6, 1849; middle initial perhaps T. Perhaps a member of the Nathan Parsons family. 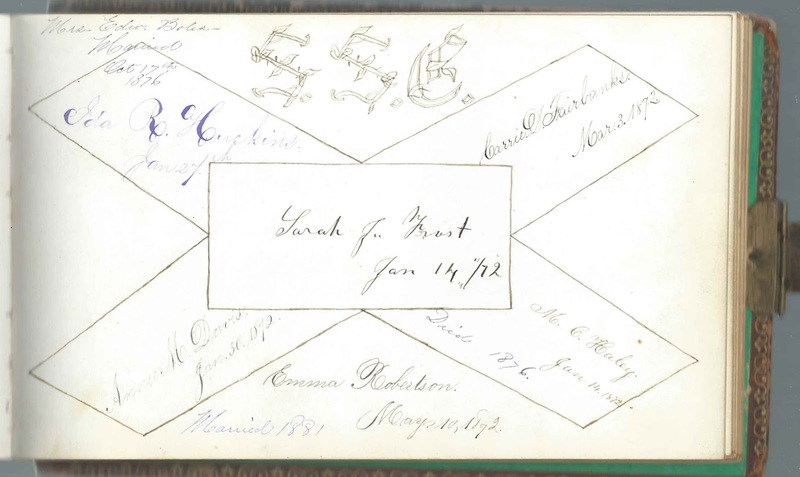 Early 1870s autograph album that belonged to sisters Caroline Ella Simonds, "Carrie", and Addie Lucie Simonds of Boston, Massachusetts while they were attending school, one of which was the Bowdoin School at Boston. Some pages are inscribed to Carrie and some to Addie. It was presumably Carrie who added notes to many pages indicating the signers' marriages and deaths. 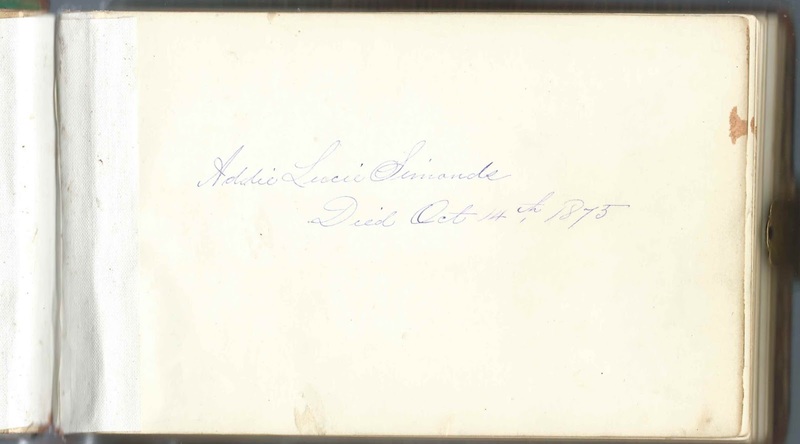 Sadly, one of the pages gives the date of Addie's death as October 14, 1875, though most, perhaps all, of the autographs were acquired earlier than that. Perhaps it was Carrie who wrote this sad news. 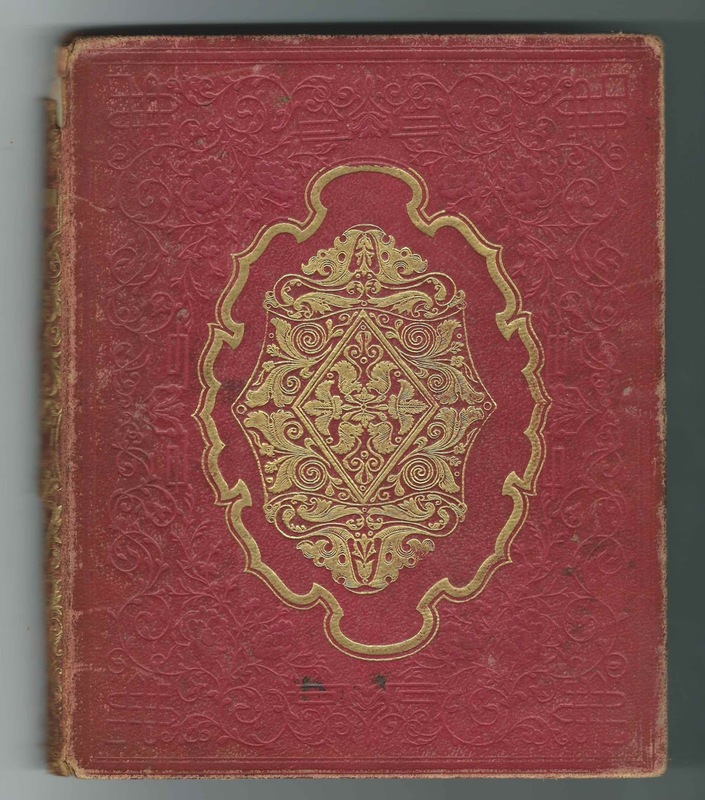 The album measures approximately 8" x 6", is unusually thick at 1", and has a metal clasp. It contains the sentiments of 99 of the sisters' relatives, friends and schoolmates. An alphabetical surname list and an alphabetical list of the signers, together with any personal information they offered, appear at the end of this post. Caroline Ella Simonds, "Carrie", and Addie Lucie Simonds were the daughters of George Henry Simonds and Caroline Augusta (Spencer) Simonds, who were born at Burlington, Massachusetts, and Cambridgeport, Massachusetts, respectively. Carrie was born November 24, 1855 at Cambridge, Massachusetts; Addie was born February 21, 1858 at Cambridge, Massachusetts. Their Uncle Charles signed a page at Cambridge, Massachusetts, on July 19, 1871. He was presumably Charles Spencer, brother of the sisters' mother Caroline Augusta (Spencer) Simonds. 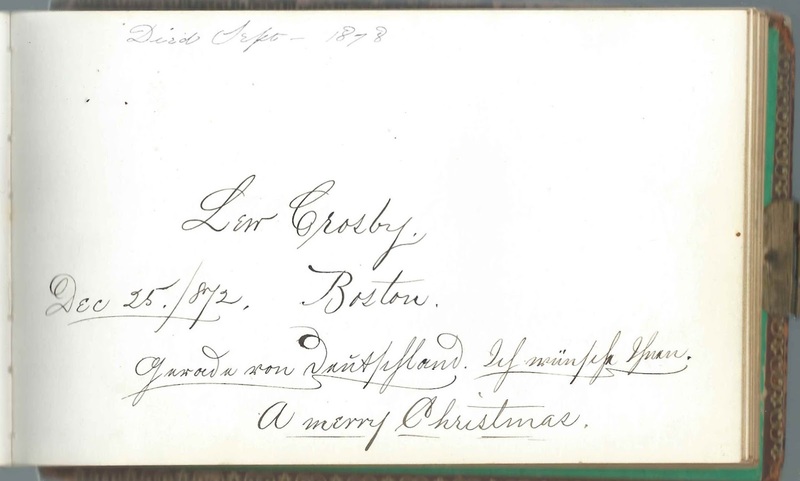 The girls' first cousin, once removed, Loammi Crosby of Boston, Massachusetts, signed a page as Lew Crosby on December 25, 1872. In 1875, he petitioned for a name change to Lew Crosby. He and the Simonds sisters shared common ancestors, Michael Crosby and wife Asenath (Blanchard) Crosby. One of the pages was signed by six people who attended or belonged to S. S. C.
Ida R. Huckins, signed January 27; later note: "Mrs. Eden Boles, Married October 17th 1876"
Unlike Addie, who died in her youth, Carrie lived a very long life. On December 6, 1882, at Boston, Massachusetts, she married widower Alden Everett Viles, son of Nathan and Lydia (Viles) Viles. Alden had a son Lawrence Viles with first wife Emma L. (Armstrong) Viles, who died in 1878, perhaps as a result of Lawrence's birth; sadly Lawrence himself died in 1883. Carrie and Alden, a Boston merchant, would have at least three children: Barbara Viles; Alden Everett Viles, Jr., who died in infancy; Bertram Simon Viles. Alden Everett Viles, Sr., died in 1914. It doesn't appear that Carrie ever remarried. She included her photograph on a passport application from 1922. Carrie lived at Boston until at least 1940, according to the Census. She died, however, at Whitefield, New Hampshire, in 1944. She's buried with her husband Alden at Mount Auburn Cemetery in Cambridge, Massachusetts. Among the well wishers in the album was the Carrie's and Addie's pastor, Rev. 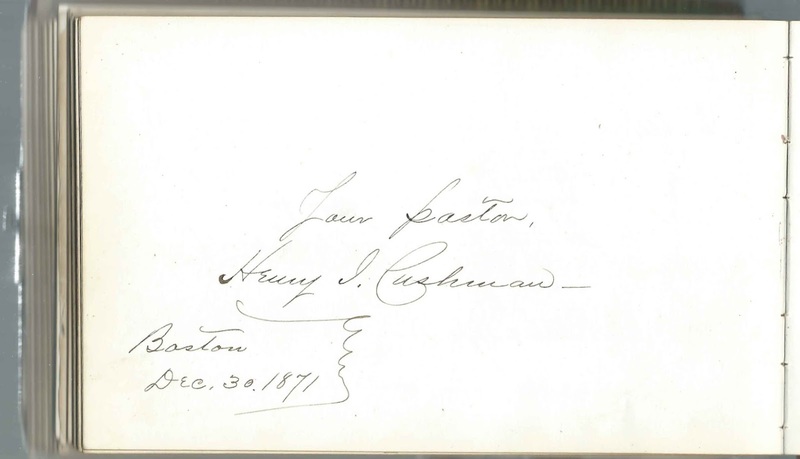 Henry Irving Cushman, who inscribed a page on December 30, 1871 at Boston, Massachusetts. "Mike", signed on June 17, 1871. "Mrs. W. H. Wood". 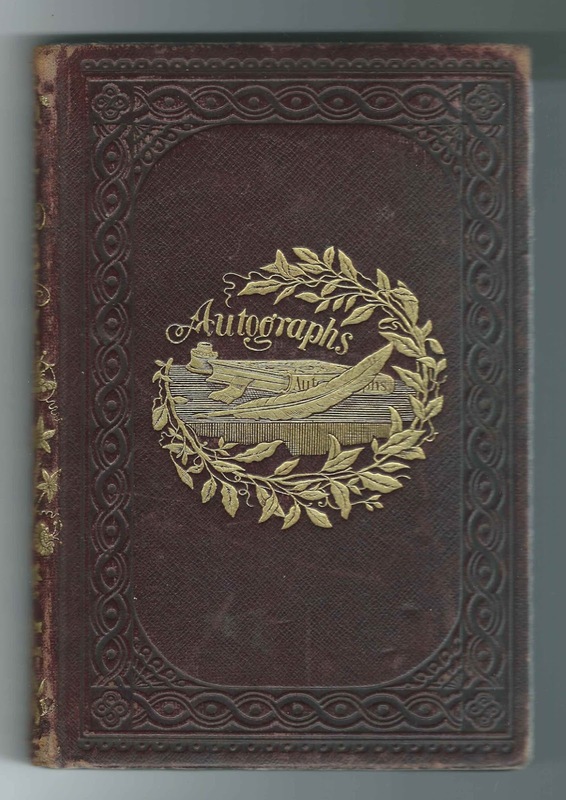 Her husband William H. Wood signed the right facing page. "Mike" may have been Emma C. (Hadlock) Wood, who married him on October 9, 1883 at Boston, Massachusetts, though there were several other William H. Woods in the area who married about that same time. Lou Barta, Jr., signed on October 31, 1872. "If Mr. S leaves Dancing school, what shall I do? (Quoted from Carrie S.)" Later note: "Married 1879". Louis Barta Jr. married Mary J. Wallace on May 15, 1879 at Boston, Massachusetts. Edward Bicknell, signed on June 11, 1872, Class of 1872 at B.L.S., presumably Boston Latin School. Annie M. Boston, signed on March 23, 1873 at the Bowdoin School at Boston, Massachusetts. S. O. Brickett, signed on January 24, 1871. Perhaps teacher Sarah O. Brickett at the Bowdoin School at Boston, Massachusetts, where some of the signers were students. D. C. Brown, signed at Boston, Massachusetts, on April 14, 1871. Later note: "Married 1878". Daniel Clark Brown married Katie Lyons Houghton on January 8, 1878 at Grafton, Massachusetts. Carrie A. Brown, signed on March 17, 1872. Later note: "Mrs. H. O. Fairbanks. Married Jan 14th 1875". Caroline A. Brown married Henry Orlestus Fairbanks at Boston, Massachusetts, on January 14, 1875. He signed the previous page. Inscribed to Addie by Florence E. Browning of Charlestown, Massachusetts, signed on March 31, 1873; "Your Friend and Schoolmate"
Minnie F. Cleveland; "Schoolmate of 1871"
Sallie M. Clough, signed at Woburn, Massachusetts, on March 21, 1871. Later note: "Mrs. Phinney, Married 1879". Sarah M. Clough of Woburn, Massachusetts, married Robert J. W. Phinney of Boston on October 10, 1878. M. Louise Crosby of Boston, Massachusetts, signed on February 9, 1872. Later note: "Mrs. Frank M. Adams, Jan. 1st 1880". M. Louise Crosby married Frank S. Adams on January 1, 1880 at Boston, Massachusetts. Lew Crosby of Boston, Massachusetts, signed on December 25, 1872. Later note: "Died Sept. 1878". Lew Crosby, son of George and Abigail Crosby, died September 10, 1878. Loammi Crosby was born at Burlington, Massachusetts, about 1851. On May 3, 1875, Loammi Crosby officially changed his name to Lew Crosby. Loammi was a first cousin, once removed, to the Caroline Ella Simonds and sister Addie Lucie Simonds. J. E. S. Damrell, signed on February 1, 1871. Later note: "Married Mar. 1880" John Edward Stanhope Damrell, son of Boston Fire Chief John Stanhope Damrell, married E. Virginia Johnson on April 12, 1880. Carrie M. Damrell of Boston, Massachusetts, signed on June 1, 1871. Later note: "Mrs. M. W. Burlen, Married Dec 6th 1876; Died Dec 10th 1878". Carrie married Melancthon W. Burlen. Charlie Damrell of Boston, Massachusetts, signed on May 18, 1871. Later note: "Married 1881." Charles S. Damrell, son of John Stanhope Damrell and Susan E. (Hill) Damrell, married Nellie G. Clarke at Boston, Massachusetts, on October 4, 1881. Annie M. Davis, signed on January 23, 1871; "Your Friend at School"
Hattie L. Davis; "Your Schoolmate"
Carrie D. Fairbanks, "Classmate of 1869 & 1871"
W. M. Fairbanks, signed on March 3, 1872. Later note: "Married Dec. 18th 1879". William M. Fairbanks married Alice M. Sargent at Boston, Massachusetts, on December 18, 1879. Henry O. Fairbanks, signed at Boston, Massachusetts, on February 21, 1871. Later note: "Married Jan 14th 1875". Henry Orlestus Fairbanks married Caroline A. Brown, "Carrie", at Boston, Massachusetts, on January 14, 1875. Isabel P. George, signed on October 24, 1872 at the Bowdoin School at Boston, Massachusetts. Lucy C. Gould, signed on April 21, 1871. Later note: "Mrs. Page". Lucy C. Gould married Prince W. Page at Boston, Massachusetts, on October 8, 1872. Carrie E. Gove, signed on October 22, 1872. Later note: "Died 1876"
Belle E. Hale, signed on February 16, 1871. Later note: "Married"
Martha J. Holt, signed at Cambridge, Massachusetts, on June 28, 1871. Later note: "Mrs. F. Osborn, Married 1878". Married Francis Osborn on June 7, 1878 at Nashua, New Hampshire. Alice P. Howard, signed on October 5, 1871; "Class of 1871"
Minnie S. Hurll, signed on April Fools' Day, 1873. Granville Hutchinson of Boston, Massachusetts, signed on June 29, 1871. 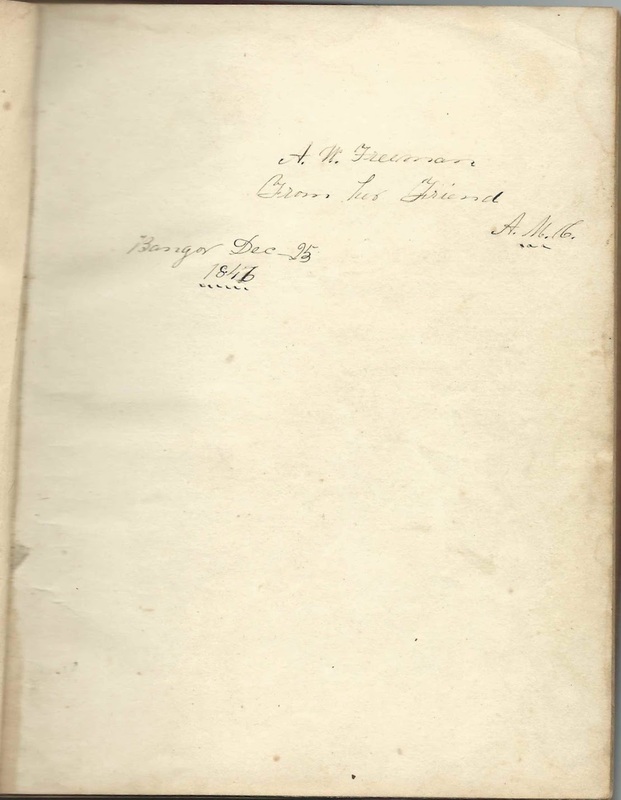 His wife, Almira (Barter) Hutchinson, signed the right facing page. Mira Hutchinson of Boston, Massachusetts. 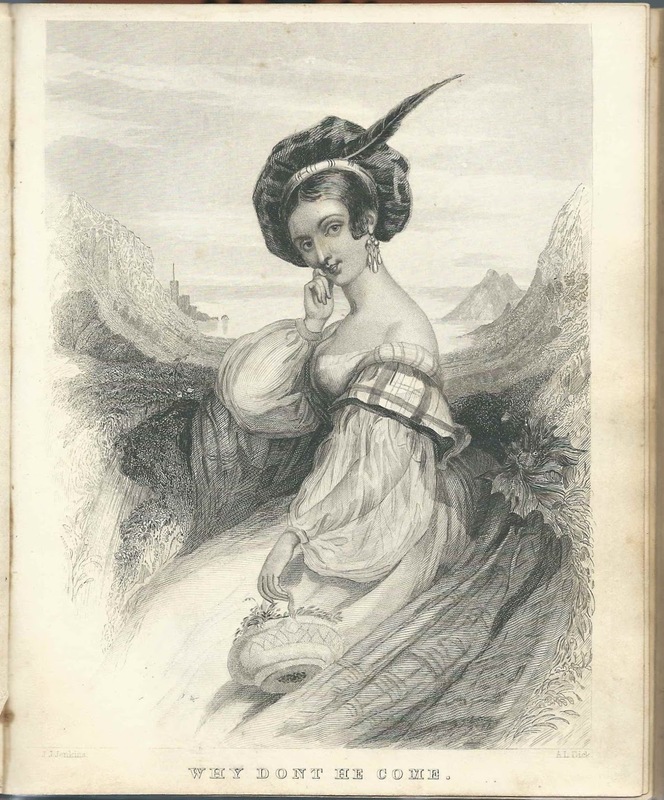 She was Almira (Barter) Hutchinson, whose husband Granville Hutchinson signed the left facing page. Julia A. Jellison, signed on January 31, 1872. Later note: "Married 1879". Jessie F. Jennings, signed on March 18, 1873 at Boston, Massachusetts. Later note: "Mrs. Fred Pope, Married 1879". Jessie F. Jennings married George W. Pope, Jr., at Boston, Massachusetts, on April 30, 1879. Augusta C. Kimball of Lowell, Massachusetts, signed at Boston, Massachusetts, on February 4, 1873. Emma F. Leland; "Classmate of 1871"
Mary E. McCabe, "A Schoolmate of 1872, 1873"
Sarah J. Mills, signed on February 16, 1871. Later note: Mrs. Luce, Married Sept 1879". Sarah J. Mills married Enos T. Luce at Somerville, Massachusetts, on October 9, 1879. Jennie P. Mills, signed on October 5, 1871; "Your Schoolmate"
Ermina D. Paine, signed at Cambridge, Massachusetts on June 27, 1871. Later note: "Mrs. Daily; Married 1874". Ermine Davis Paine married Sumner Daily. John S. Pollard, signed at Cambridge, Massachusetts, on July 17, 1871. 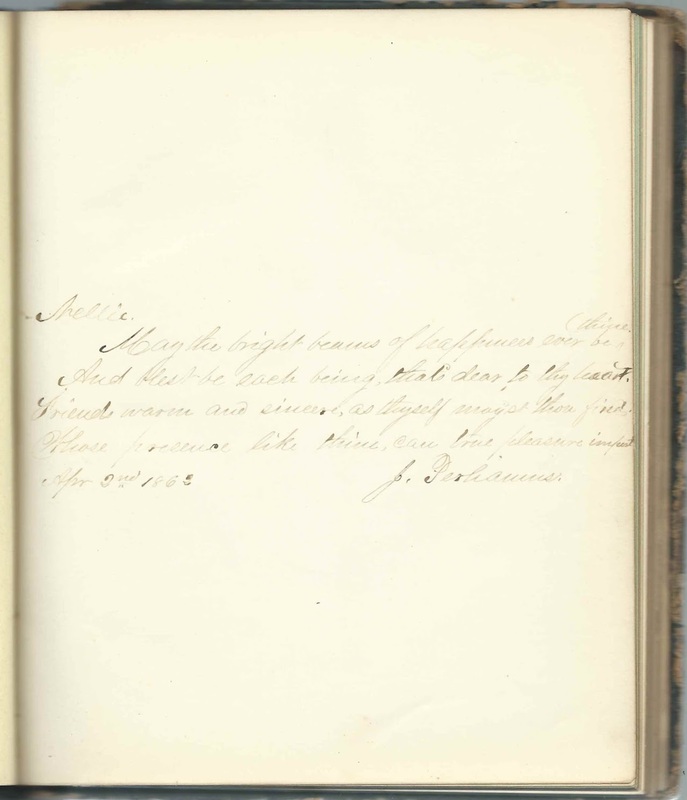 His wife Eliza Ann (Dyer) Pollard signed the right facing page. Eliza A. D. Pollard, signed at Cambridgeport, Massachusetts, on July 14, 1871. 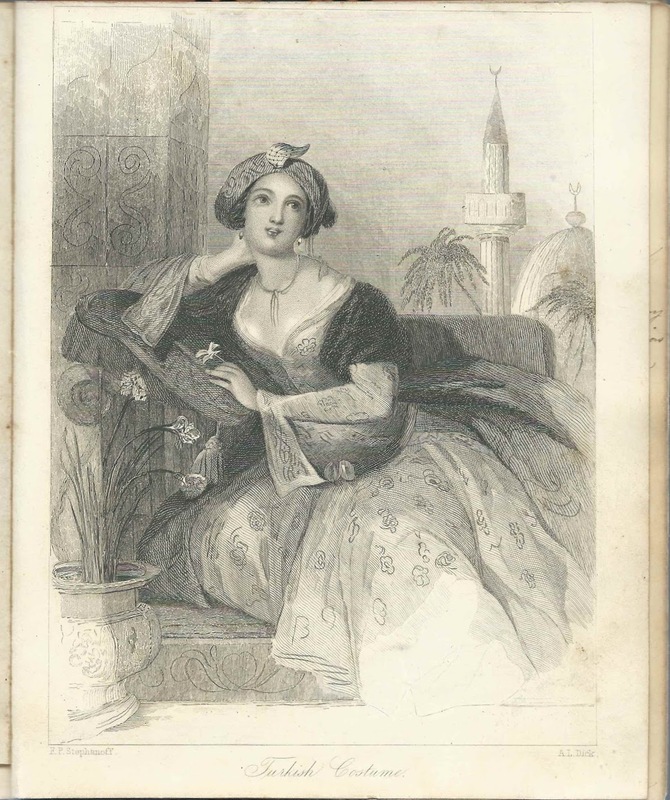 She was Eliza Ann (Dyer) Pollard, whose husband John S. Pollard signed the left facing page. Mary D. Priest, "Classmate for 7 yrs". Later note: "Mrs. J. D. Blodgett, Married Nov. 1881" I found a record of the marriage of November 3, 1881 between Mary D. Priest and Warren K. Blodgett, Jr.
Caroline Ella Simonds, "Carrie",co-owner of the album with her sister Addie Lucie Simonds. Daughters of George Henry Simonds and Carolina Augusta (Spencer) Simonds. Addie Lucie Simonds, co-owner of the album with her sister Caroline Ella Simonds. Daughters of George Henry Simonds and Caroline Augusta (Spencer). Simonds. Lottie H. Smith, signed on January 30, 1871. later note: "Mrs. C. H. Hall, Married Jan 21st 1877". Lottie Howland Smith married Charles Wells Hall on March 21, 1877 at Boston, Massachusetts. Annie S. Souther, signed at the Bowdoin School at Boston, Massachusetts; "Your Classmate of 1871". Later note: "Married 1880". She may have been Hannah L. Souther, who married Samuel Kneeland, Jr., at Boston, Massachusetts, on October 18, 1880. Albert A. Spencer, signed at Cambridgeport, Massachusetts, on July 20, 1871. Uncle Charles, signed at Cambridge, Massachusetts, on July 19, 1871. Presumably Charles Hosea Spencer, brother of the girls' mother Caroline Augusta (Spencer) Simonds. Julia Stone; "Schoolmate of 1871"
Julie W. Thornton, signed on January 30, 1871; "Bowdoinite", referring to the Bowdoin School at Boston, Massachusetts. Lizzie B. Vinal, signed on January 30, 1871. Later note: "Died - 1872"
Carrie A. Willard, signed on October 23, 1876. Later note: "Died Feb. 1877"
William H. Wood, signed on June 17, 1871. His wife signed the left facing page. Mary Young, signed at Boston, Massachusetts, in January 1871. 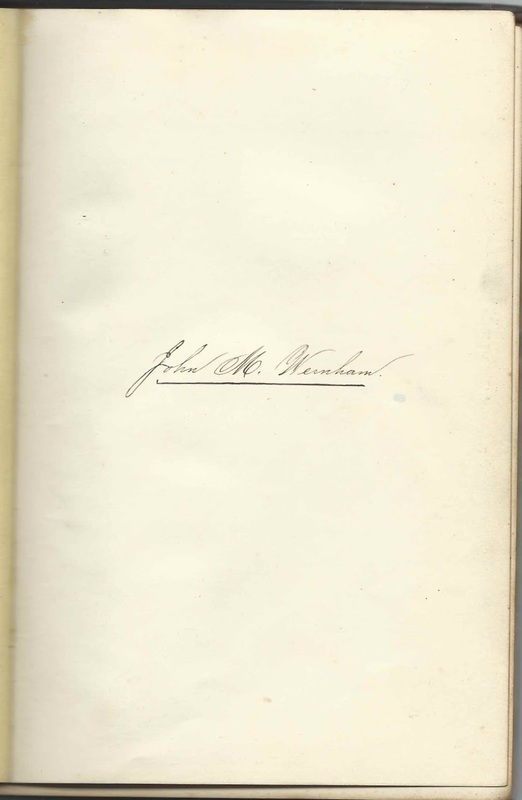 Later note: "Died 1893"
1860+ autograph album of John M. Wernham, who was born in New York, lived in New Jersey and later moved to McHenry County, Illinois, with his parents and siblings. The wellwishers hail from all three states. 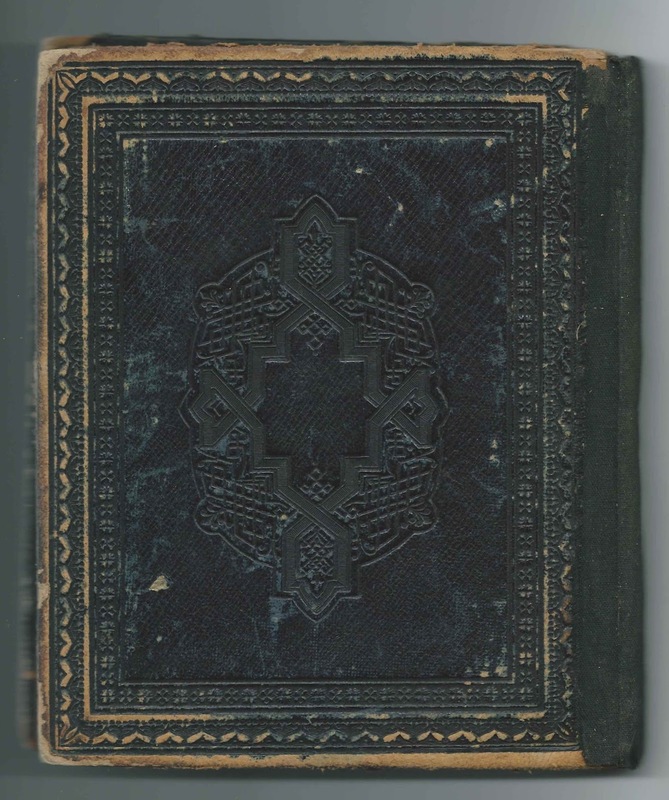 The album is approximately 8" x 5-1/2" and contains the sentiments of 35 of John's relatives and friends. An alphabetical surname list and alphabetical list of the signers, together with any personal information they offered, appear at the end of this post. John M. Wernham was born August 30, 1842 in New York City, I believe, the son of James Wernham and Margaret (Mackenzie) Wernham, who was born in New York or New Jersey. In some sources, James is shown as an English immigrant; in others, he was shown as born in New York. The confusion may have resulted from the fact that, according to one source, his father had the same name. 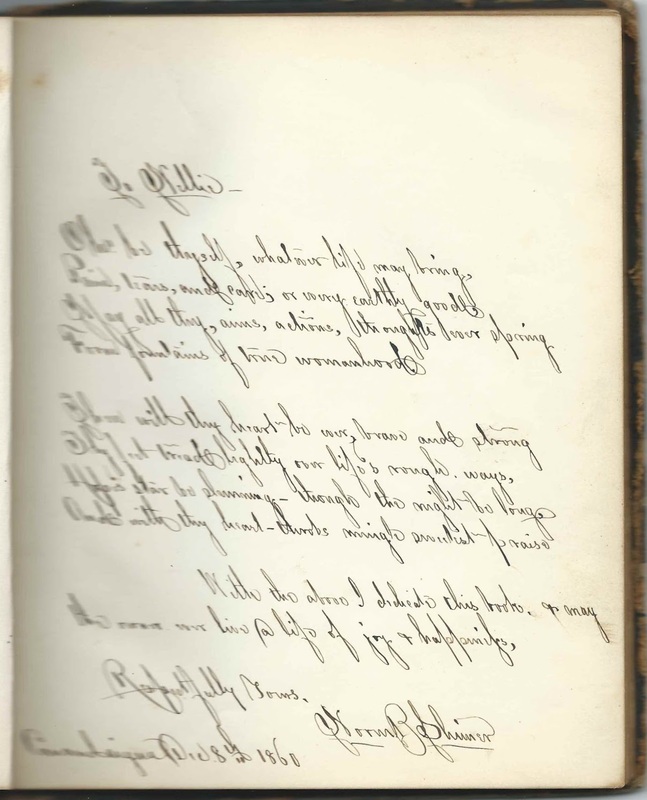 Three of John's siblings inscribed pages in the album. 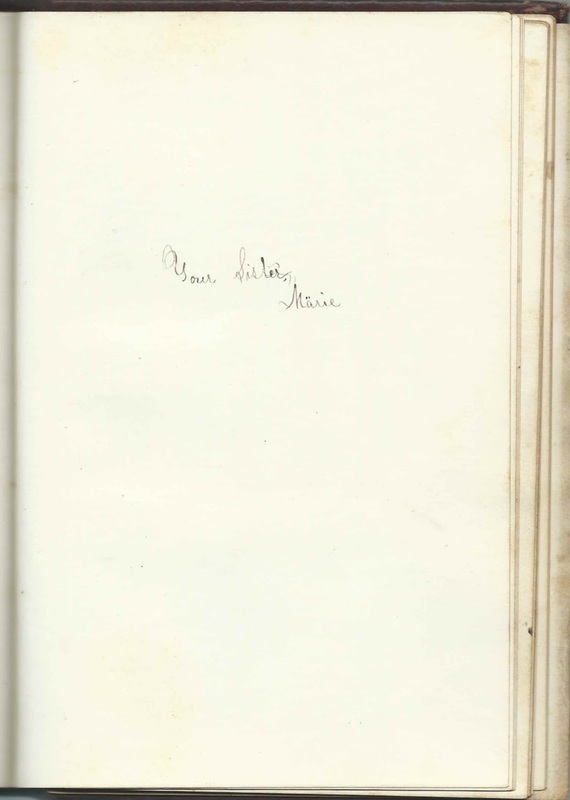 Mary, or Marie, signed a page as Marie. She would later marry William Abbott, a Massachusetts native, and they would make their home at Marengo, Illinois. She may have met him in Illinois. 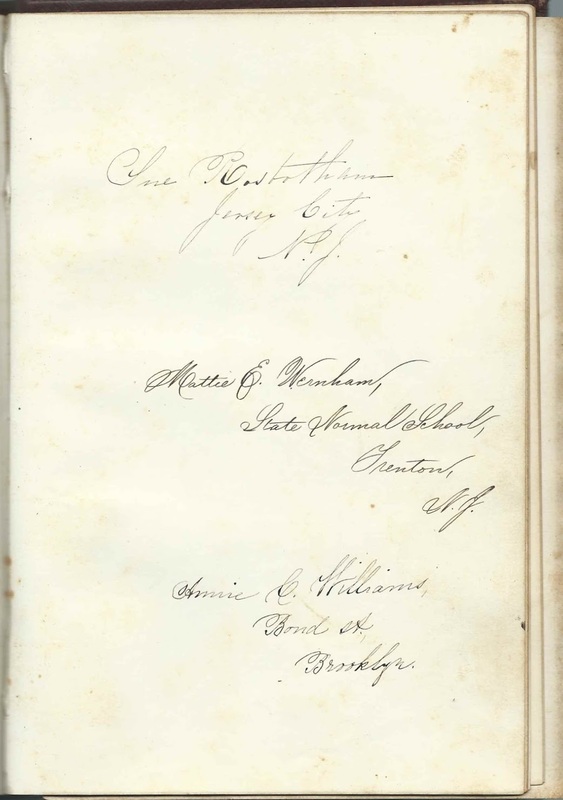 Sister Martha Elizabeth Wernham, "Mattie", signed a page while she was a student at the State Normal School at Trenton, New Jersey. 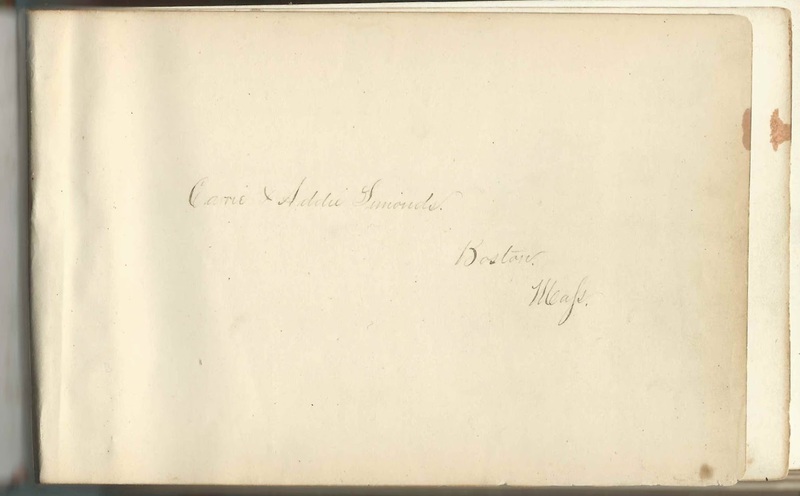 Two other people, presumably fellow students, also signed the page: Ine Rosbotham and Annie C. Williams. Mattie would later marry Charles William Ingersoll, who also signed a page in the album. 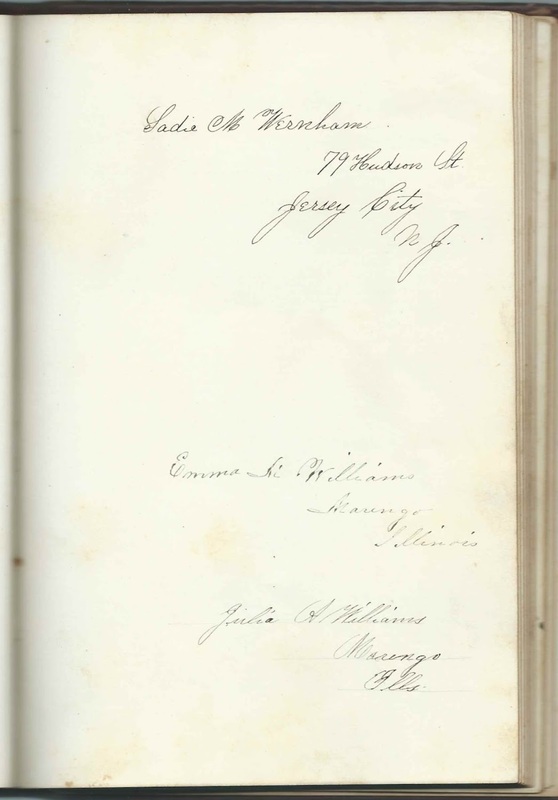 Sister Sarah M. Wernham, "Sadie", also signed a page with two other people: Emma M. Williams and Julia A. Williams. Sadie gave her address as 79 Hudson Street, Jersey City, New Jersey. Sadly, Sadie would die on April 1, 1863 in Illinois. At some point after 1860 the Wernham family moved to McHenry County, Illinois, in the area of Riley and Marengo. Another sibling, Spencer Cone Wernham was a noted physician in Illinois, as was his son James I. Wernham, possibly named for his paternal grandfather. 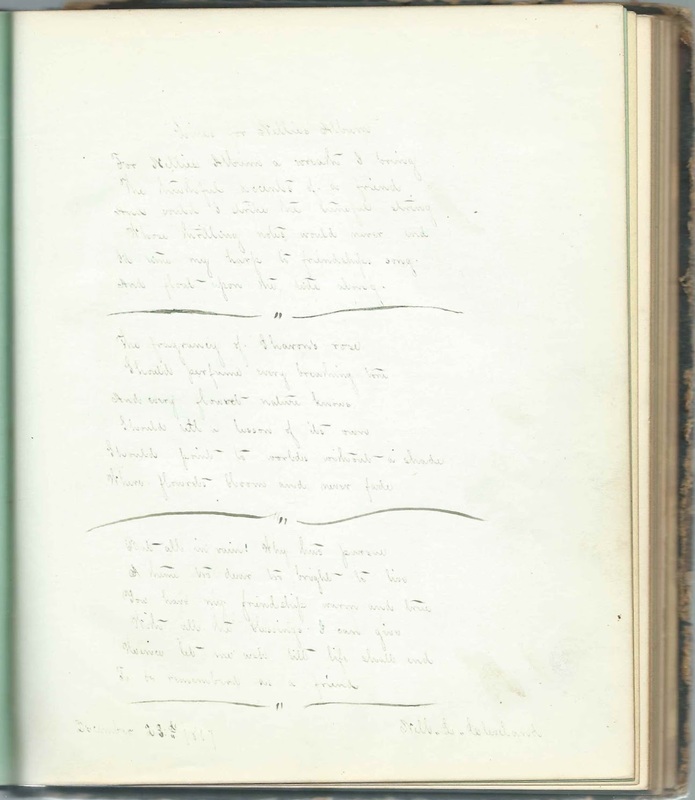 Four signers named Mackenzie inscribed pages in the album: John, Sr; John; Robert; and William. It's tempting to think that John Mackenzie Sr. might have been Margaret's father and John, Robert and William her brothers, but I haven't as yet found evidence of that. On May 3, 1864, John M. Wernham enlisted in Company F of the 141st Illinois Regiment. He died just a few months later at Columbus, Kentucky, on September 21, 1864, whether from disease or battle wounds, I don't know. I also don't know if he's actually buried with his parents and sister Sadie, as their shared stone at the City Cemetery at Marengo, Illinois, implies. D. Emory Halteman of Marengo, Illinois; presumably David Emory Halteman. A. J. Lyon of New York. 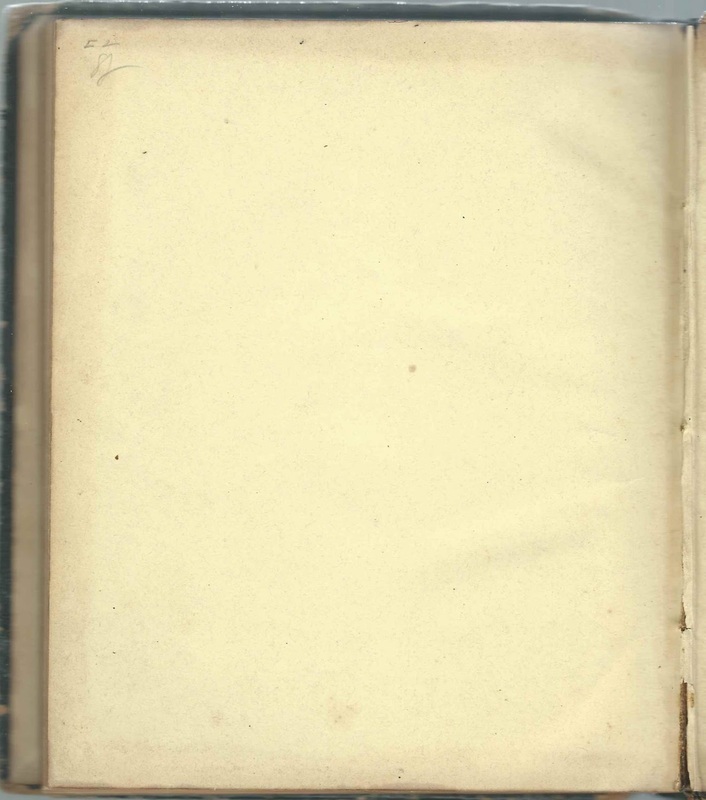 Possibly Albert J. Lyon, whose wife Mary J. Lyon signed the right facing page. 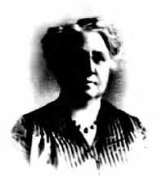 Mary J. Lyon of New York. 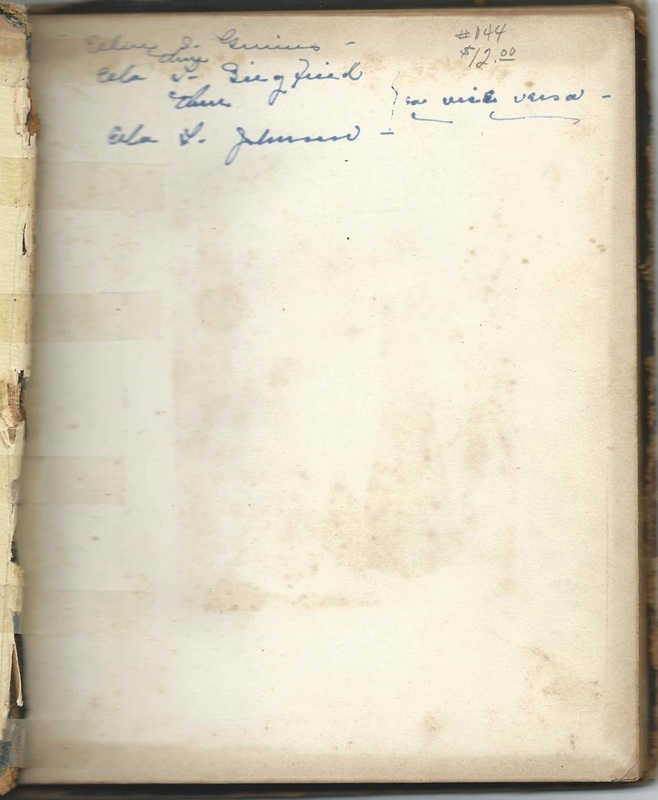 Possibly the Mary J. Lyon who was married to Albert J. Lyon; an A. J. Lyon signed the left facing page. "Your Sister Marie; Marie or Mary Wernham, born about 1840. About 1863 she would marry William Abbott, a Massachusetts native. They would live at Marengo, Illinois. 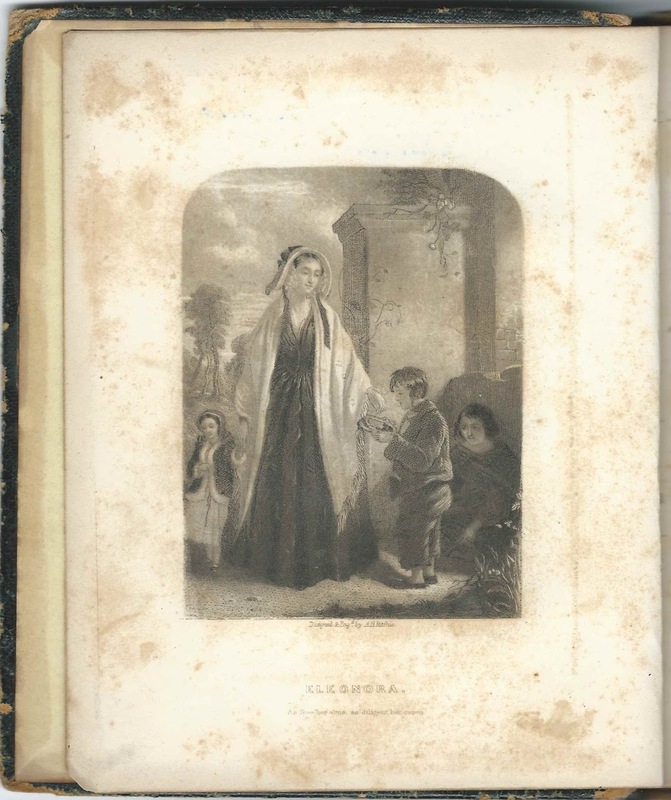 1860s autograph album that belonged to Mrs. Ella I. Grimes, wife of Hollister N. Grimes of Canandaigua, New York. Her maiden name, according to an account of her death, was VanOrsdall, perhaps a variant of Van Arsdale. 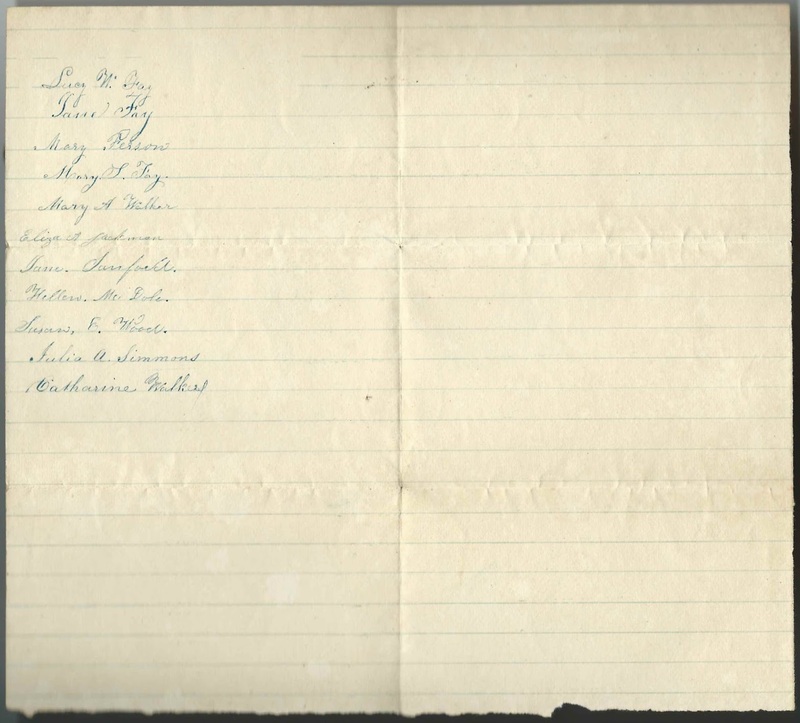 The first end paper mentions: 1) Ella's name, Ella I. Grimes; 2) the married name of Ella's daughter Ella L. (Grimes) Johnson; and 3) the married name of her friend or relative - niece? - Nell L. Cleveland Siegfried. The album measures about 8" x 6-1/2". 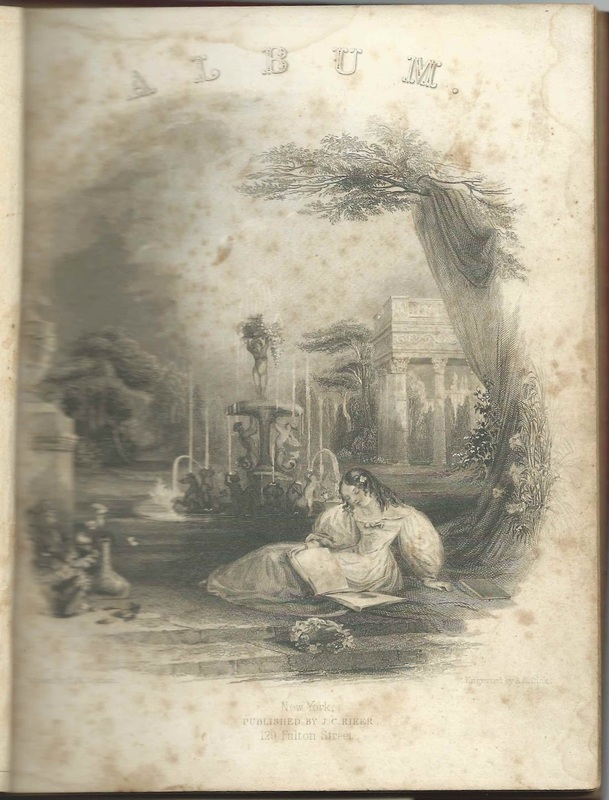 There are very few inscriptions in the album, so I'll feature them all, in page order, including the engravings. 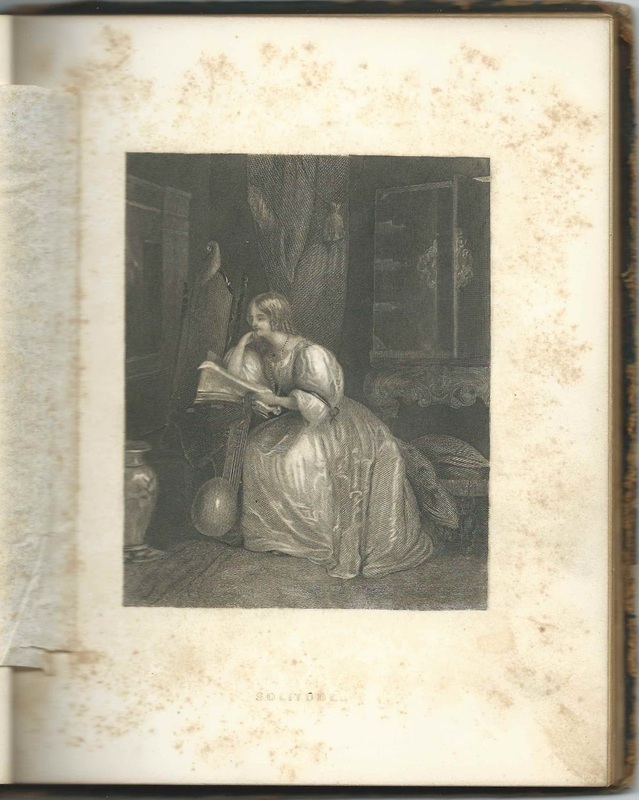 The first engraving in the album is entitled "Eleonora, As Free her Alms, As Diligent her Cares". Designed and Engraved by A. H. Ritchie. 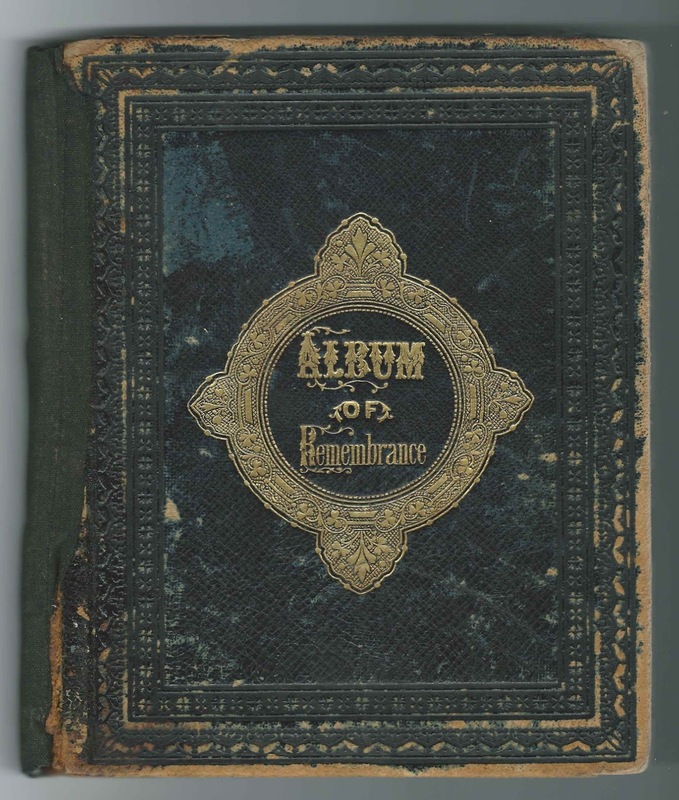 The title page: Album of Remembrance, published by Leavitt & Allen of New York. J. Perliamus inscribed a page on April 2, 1862; perhaps John Perliamus of Canandaigua, New York. Nell L. Cleveland, signed on December 23, 1867. She was married to Charles A. Siegfried at the home of Hollister N. Grimes at Canandaigua, New York, on April 27, 1877, according to a notice here. Nell was living with Hollister and Ella at the time of the 1870 Census of Canandaigua. Ella I. VanOrsdall was born about August 1848 in New York, the daughter of James and Sarah VanOrsdall. She married Hollister N. Grimes, son of Nahum and Amanda (Humphrey) Grimes. Their daughter Ella L. Grimes was born about 1870. Daughter Ella married George F. Johnson about 1893. If you have information on the Grimes, VanOrsdall, Cleveland, Siegfried and/or Johnson families, or if you have information on the signers listed below, please leave a comment or contact me directly.